Happy Saint Patrick’s Day! 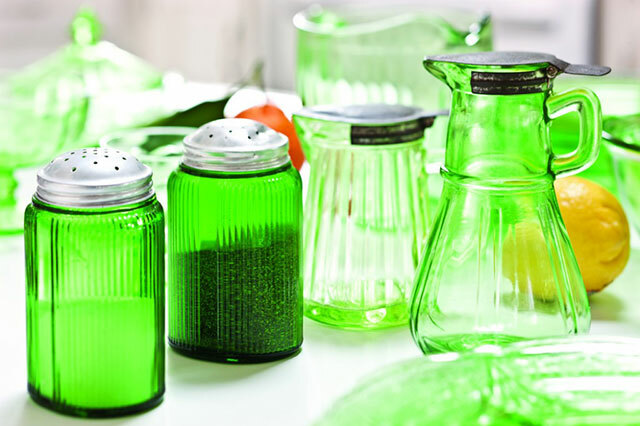 Instead of wearing green today, how about setting a green table? I don’t know about you all, but the weather is finally starting to warm up here, and spring is in the air. With spring comes the color green—many different shades of green. Whether it’s the green of new grass or the green of tulip stems, this color inspires me to add bright decor touches around my home. 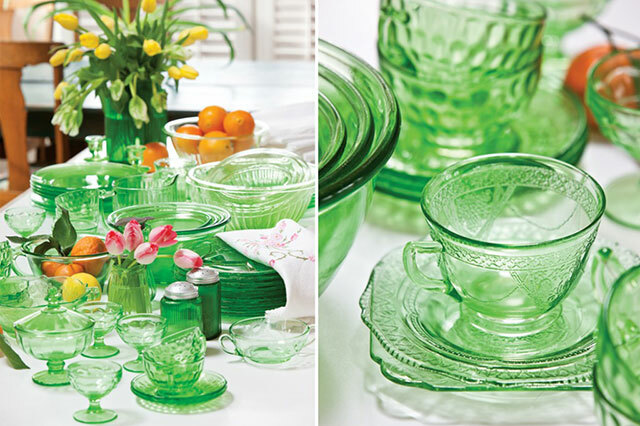 Why not consider unpacking your old china and glassware collections in various green tones? You might not often consider mixing styles and patterns of glass, but when they have a common color, they can easily be combined. Set your table with a mix of styles, and see how they coordinate perfectly when all are in one family of colors. Add pops of spring pinks and yellows by adding fresh-picked tulips from your garden. Offset all of the green with clear glass pieces as well. When you’re finished, you’ll have a setting that’s simply stunning. How are you celebrating Saint Patrick’s Day? Or are you? Stunning table and dishes! What lovely greens! Beautiful pictures of the green glass. Bring on Spring! I made mashed potatoes mixed with mashed turnips and cream (great comfort food), which I always called “champ”, though what some people call champ is mashed potatoes with scallions. My grandmother used to make champ. I recited the old grace we used to say at home, and feasted on my potatoes and milk – what many of our Irish ancestors lived on. Another treat I make myself is a vanilla ice cream float in Guinness – it’s actually very good! Thank you for reminding me of my aunt’s Waterford crystal! I am a Patty, named by a nursery nun in the hospital where I was born. Of course in 1950, I am not sure if I was named after St. Patrick or Patty Paige. Married an Irish boy too and have always had fun with the heritage. Took our 3 kids to Ireland in ’99 and travellled around in a station wagon. They were quite irreverent twenty somethings and we laughed a lot. We were able to get most of them together for Corned Beef and Cabbage this year. My husband makes a big deal about the home made soda bread recipes from our grandmas. Grandsons are very curious about the lore, but do enjoy it, especially the leprechaun stories. Love the Irish optimism passed down by my Irish dad and his twin. Enjoy your blog and your blogging friends! Green! My favorite color. To see a table set with it, for any occasion is a delight. Glad you shared the setting with us. Happy St. Patrick’s day to you! Lovely table setting. HAPPY ST. PATRICK’S DAY. I am part Irish. What is the name of the pattern of the green dessert set glassware? I’d like to search for pieces at Replacements, Ltd.
My great grandmother was Irish and I have been blessed with many pieces of lovely Irish pottery. As always, we have the typical corn beef and cabbage, sing Irish folk songs and finish our dinner with tea served in an old Belleek tea set. The set is quite fine and delicate, reserved only for St. Patrick’s Day. 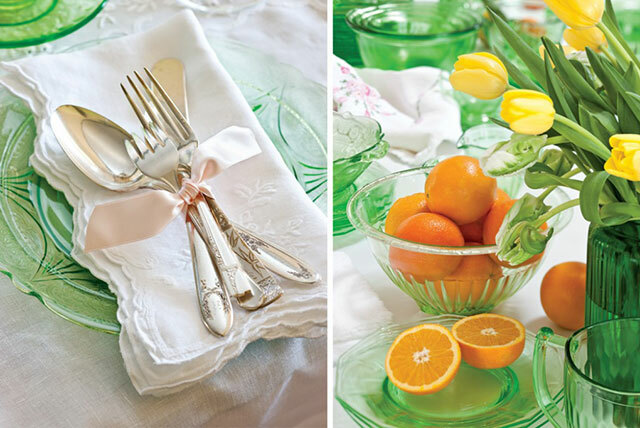 The green glassware reminds me of antiques my mother has. Today is her 96rh Birthday as I celebrate with her today. Not bad for an Irish lady by the last name of Kelley from Virginia. Happy Birthday Mom!! Always love your blogs!! For a lovely read of the Irish, I recommend Jan Karon’s book “In the Company of Others”. 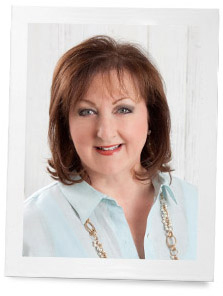 I was first introduced to her writing through the Victoria magazine and have been so blessed because of that…every book has been such a delightful read and I have re-read them over and over! Also, I recommend taking a trip to Ireland with Ray Hughes. He is a wonderful Irish musician, songwriter, author/storyteller, poet, speaker, historian, etc. You can find out more about a trip to Ireland on his sweet wife’s Penny Whistle Tours…more information is available at their website: RayHughes.org. My Granddaddy Carman was born on St. Patrick’s Day but my Granddaddy Divine was the Irishman/Scotsman. A very precious teaching partner, Jenny, was also born on St. Patrick’s Day. My Granddaddys are both gone now but I plan to make a casserole and a cake to take to my sweet friend as she is still teaching and loves it when I bring food and she doesn’t have to go home and fix supper (that’s what we call the evening meal in our “neck of the woods” here in the Ozarks) after a hard day at school…I remember those days and how tired I would be some evenings with papers still to grade, lessons to prepare, more and more forms and procedures to fill out, etc., etc.! May God bless teachers everywhere today as they try to make sure “no pinching” is going on in their classrooms! :o) Happy St. Pat’s Day! Thank you for your blessing for teachers. It is nice to know there are still people out there who value teachers and what they do. I currently teach 4th grade, and it often feels like public opinion is becoming more and more hostile toward teachers these days. What a blessing your meal must have been for your teacher friend. Also, I’m happy to report there were no “pinching” problems in my classroom today–just students a little bit hyper from the excitement of the day. Phyllis, I love your green dishes. How lucky your family is to have your creative touch in their lives. Summer is coming and you’re going to make it! My Mom who is no linger with us would have loved your beautiful table settings. I love them. I have the green crystal water goblets, antiques inherited from my husband’s grandmother, so I would love to find other green crystal pieces, such as cups/saucers/dessert plates. 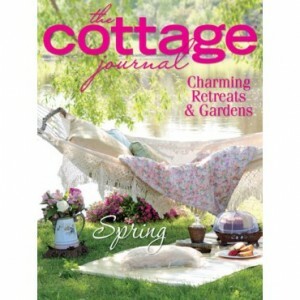 Your blog is pure JOY! Today I will have a cup of tea from a china cup my husband brought me after taking a March trip in the ’80’s…bone china, white, and decorated with shamrocks. This is a grand day for our family! My Irish grandfather named me before I was born. He told my Mom…. Someday when you have a girl, please name her Colleen. Sadly, I was never able to meet him, for he past away before I was born…. And named, Colleen. Traditionally I have a St Patrick’s party with Corn beef and cabbage… And all the fixin’s!! All are welcome to enjoy…somehow it’s like the loaves and the fishes…we never seem to run out. On the years we don’t have the party, a pass to the pub for Guiness or an Irish coffee is a must. This morning I received a darling picture of two “fine” Irish lassies…. My granddaughters, Amelia and Evelyn. Made my day!!! 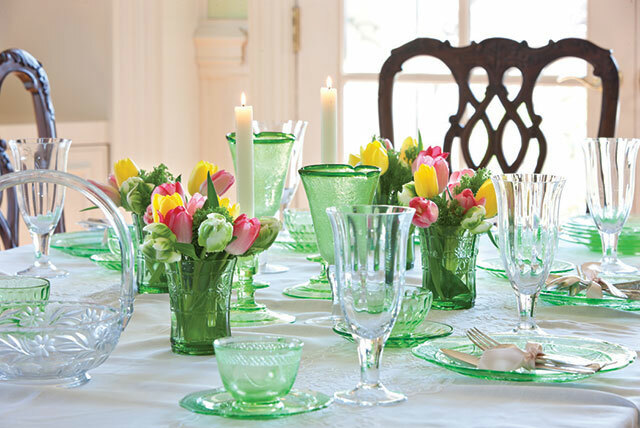 As my Daddy’s birthday fell on St. Patrick’s Day, we always set something of a green table. Always included were mementos from his childhood that reflected his connection to the saint’s day. The tablescapes is beautifully Irish. I love finding your journal entry in my daily email. Have a day blessed in green and happiness. Thank you for giving so many of us a taste of the South. Your table setting is beautiful. Since we are Catholic, we celebrate today the life of this Saint by reviewing with the kids the meaning he gave to the shamrock. For fun we bake shamrock shape cookies, green cupcakes and mini soda breads as gifts. Something for everyone! Love your green dishes. Makes me smile. Thank you for sharing. Such a beautiful table Phyllis. I have just one small pressed green glass plate I was lucky enough to find some time ago. Last night we had an Italian Irish evening (for 22 best friends) with many shades of green plus white and red accents. Italian themed food and Irish decor with red ribbons, candles and roses. It was a fun combination. Sending wishes for a lucky day to all! This is just beautiful! I love your blogs. They make me happy! I always celebrate St. Patrick’s Day as I am 100% Irish. All my grandparents came from Ireland . All my ancestors are from there and I still have a 2nd cousin there. My aunt used to visit Ireland every August. She asked me one year, when I was about 6/7 what did I want her to bring me back? I said a leprechaun in a bottle. I meant a real one. She did bring me back a leprechaun in a bottle, just not a real one. When I was raising my family, I went all out decorating, baking and celebrating, playing Irish music for days. I would even dress my German Shepherds in green hats or neckties. Great fun. My girls do not have the interest in their heritage which makes me sad. In recent years I celebrate with my “3rd daughter” who is Irish, Italian. We order pizza and watch the movie Darby O’Gill and The Little People”. Great fun. We wear Irish hats, one of us cooks shortbread and other goodies and of course have our Irish Tea. Don’t despair about your daughters and their heritage–they may come around yet. Here’s an idea to help: you might consider putting together a book for them containing memories, photos, and life stories of some of their ancestors. Anyone who wants can access the millions of ancestral records found in the LDS Church’s genealogy library by going to http://www.familysearch.org. At that site you may find information about ancestors that even you don’t know. My Italian heritage has meant much more to me after I learned the names and stories of some of my ancestors. I even traveled to the small village in Italy where my great grandparents lived before they immigrated to America. There is much fun and excitement to be found in genealogy research.